Two weeks from Election Day with the all critical majority of the Hoboken City Council up for grabs and the mood is turning sour in the Darksider Old Guard camp. Outside of former councilman Ruben Ramos who is comfortable with his base of support in the fourth ward, the other ward races show signs his fellow council running mates are highly agitated or worse. The Hudson Reporter, the pro Old Guard rag announced on behalf of the Darksiders confidence they are looking at a sweep but the obvious contradictions in the story say otherwise and point exceedingly to one sharp Italian resident running in the first ward: Michael DeFusco. His unstoppable energy in the race directly calling into question the "Council of No" votes by Terry Castellano as she seeks 25 years on the Hoboken legislative body has set the Russo Clan into full panic mode. Some of the most ugly votes in question on the last possible bidder in the eleventh hour to save Hoboken University Medical Center, repave Washington Street and to approve a 9-11 Memorial are ones Castellano cast since 2011 when she was last reelected. Castellano's excuses don't add up on any and hatred in two words explains it: Mayor Zimmer. Yesterday, a report on Grafix Avenger conveyed the fear and loathing of DeFusco as the full deck of Hudson County dirty tricks have begun to make an appearance. Going into that deck of desperation is surely a sign and it isn't one of confidence. According to the Grafix Avenger report, the Russo Clan is dipping into their well of dirty tricks and there's allegations of a woman calling first ward voters pretending to be Michael DeFusco's mother. The objective is to anger downtown first ward voters not to vote for DeFusco and even better to lend a vote to Castellano. Isn't one of the only rules in the Russo Clan campaign playbook La Famiglia is off limits? Back in 2013, a photo of the Russo faction ally Ruben Ramos with council running mates and Anthony Russo, the disgraced former mayor and convicted felon appearing on midnight flyers set them into a tizzy. MSV personally encountered the flyers on poles on upper Hudson Street at night not a block from the Mason Civic Association at 12th and Washington. Hat tip: FinBoy. Eduardo Gonzalez who saw pressure from the Old Guard to be their new stand-in vote on the City Council and make a run against fifth ward Councilman Peter Cunningham is now rumored desperate enough to play the race card. When Gonzalez served on the Hoboken Housing Authority Board, he was a steadfast ally and vote of the significantly disgraced actions of Carmelo Garcia and in one tussle he whipped out the race card against a fellow HHA commissioner. No one's forgotten it but playing the race card now alleging antipathy to Hispanics would be the lowest blow Hoboken's had to suffer since Gonzalez's running mate ally Michael Russo used it in a 2013 City Council meeting against Cunningham and Reform oriented council members when they wouldn't sign on to the Vision 20/20 redevelopment scam. Gonzalez along with Russo and the Old Guard council enthusiastically backed a plan to more than double the size (and density) of the downtown Hoboken Housing Authority with nothing more than a color brochure filled with empty re: non-binding promises. Many HHA residents loathed the idea and felt threatened as their so-called "bill of rights" never were put in writing. Neither was an actual plan for Vision 20/20. Carmelo Garcia the circus ringleader of Vision 20/20 completes a trifecta on that Russo faction ticket of its slate who love to get down and dirty in the mud and drag Hoboken down with it. As many know, Garcia has cost Hoboken taxpayers already $150,000 with his infamous "ethnic cleansing" civil lawsuit. Garcia also is holding on the hook hostage the Hoboken Housing Authority which he financially ravaged and left in a seven figure deficit. (Eduardo Gonzalez previously wrote a letter praising his financial impact at the HHA while backing every Garcia proposed resolution.) Mister Carmelo would like to think he can con a jury he's a million dollar victim but is there a paper trail problem not disimilar to the Bajardis? See: the Benchslapped Series. The alliance rumored between Peter "Monarch Man" Biancamano and lame duck councilwoman Beth Mason is escalating. Biancamano has been seen around the Mason Civic headquarters and is believed by some to be among several candidates who will be seeing Mason family money hit their campaigns. The other two Old Guard candidate beneficiaries are thought to be Eduardo Gonzalez and Carmelo Garcia. Biancamano is the Old Guard chosen successor to follow "Develop or Die" Beth Mason's adage and he's not said a solitary word about supporting the City's legal efforts to kill the Barry family's efforts to build the Monarch towers uptown. The Barry firm, Ironstate Development is also behind the Applied Companies and racheting out votes there for the BoE trustee Biancamano. 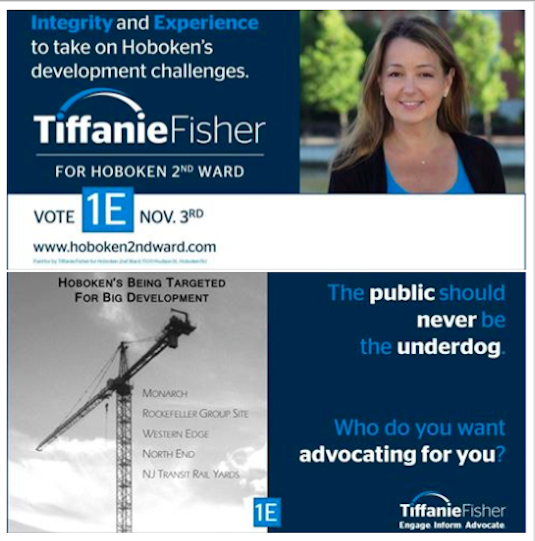 The Tiffanie Fisher mailer to uptown Hoboken second ward residents highlights her supporting the public on matters of big development contrasting Peter "Monarch Man" Biancamano who appears to be the Old Guard successor to "Develop or Die" Beth Mason. He hasn't said he'll oppose the Monarch Project towers. As Hoboken winds down to Election Day, campaigns are mounting up and the soul for Hoboken, newcomer, Old Hoboken and other residents alike are the stakes in the November 3rd election. Once you sell your soul to certain devils, you never get it back. Let the buyer beware.